The life of composer Richard Wagner was a fairly tumultuous affair. He was a revolutionary in terms of both his politics and music, not to mention the extra-marital liaisons. Basically, prime picking to be the subject of his own opera. And that is what Jonathan Harvey has done with this visually stunning and, at times, witty modern piece of performing art. First performed in Luxembourg in 2007, the opera is this time performed by Welsh National Opera (WNO). It reached Birmingham Hippodrome as part of the first theatrical tour of the show in England. The action and stage is split between acting scenes (in German) and the opera (mainly in Pali and Sanskrit). In the foreground, Wagner's final hours after suffering a heart attack are acted out at his Venice home. Gerhard Brossner is compelling and believable as gruff, insensitive Wagner, who has some great sharp one-liners, particularly to his long-suffering wife, Cosina. Tensions between Cosina grow when his singer lover, Carrie Pringle, turns up. Wagner is oblivious to most of this though as he is dozing between consciousness, experiencing visions of a strange Buddha and the opera he has yet to complete, re-telling the tale of Buddhist lovers Pakati and Ananda. It is this operatic "vision" that takes place on a higher stage, mainly sung in Pali and Sanskrit. Lovers Pakati and Ananda are central to the storyline in Wagner Dream. Photo credit David Massey. Large video screens provide a backdrop of atmospheric images, while the orange robes of Buddhist monks and flames contrast vibrantly against Wagner's dark final moments. While aesthetically pleasing, be prepared that the music is not as gentle and timeless as some of Wagner's most famous works like "The Wedding March" and Der Ring des Nibelungen. In fact, some of this soundtrack feels harsh on the senses. 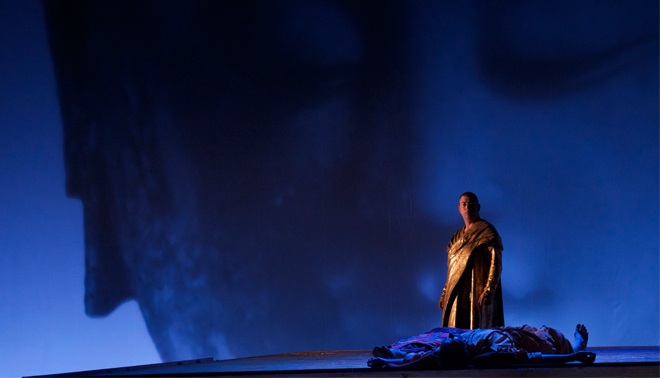 However, hardened opera fans will appreciate the intensity of the songs and the skill involved in performing them, particularly by David Stout as Buddha and Richard Wiegold as Vairochana. It is also pleasing to see that the orchestra is on stage, strategically positioned between the two performance areas, instead of hidden in the pit. Wagner Dream isn't like any traditional opera you will have seen, and for that reason alone, it is worth challenging the routine to experience it. It's unusual, clever and, most of all, visually decadent. The Welsh National Opera summer season continues at Birmingham Hippodrome until Saturday with Wagner's Lohengrin and Puccini's Madame Butterfly. For more information, visit the Birmingham Hippodrome Website.